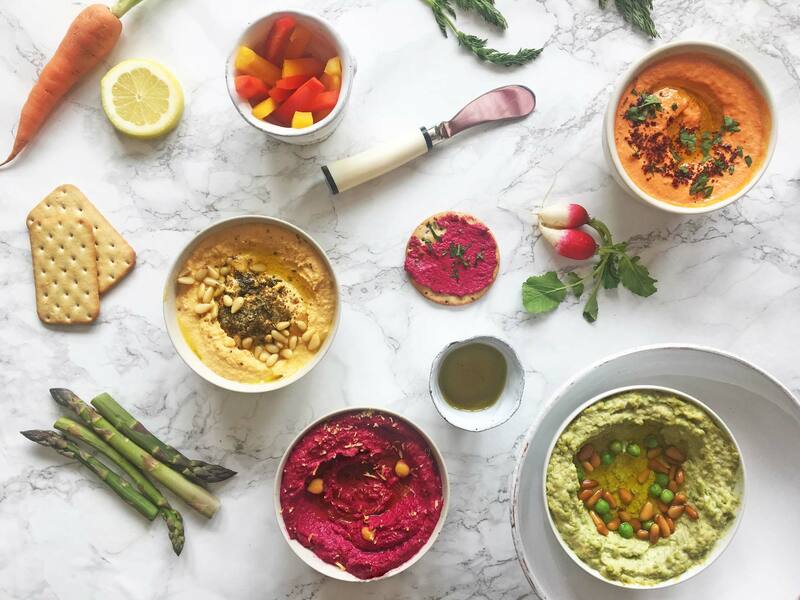 Hummus is a great protein-rich snack, made even healthier with the addition of seasonal veg – choose from red pepper, green peas, beetroot, and carrot – in these four vibrant recipes. If using tinned chickpeas, wash thoroughly and cook for 5 minutes. If using dried chickpeas, soak 1/3 cup chickpeas overnight in plenty of cold water along with ¼ tsp baking soda. Drain and cook on high in cold water for 40 minutes or until tender. Rinse before using. In a food processor, blitz cooked chickpeas until powdery clumps begin to form. Add garlic, salt and lemon juice and blitz again. With the food processor running, slowly add tahini. Add water 1 tablespoon at a time, until hummus reaches desired consistency. You might need up to ¼ cup water. If using store bought roasted red pepper, skip to the next step. Preheat oven to 260C. Place 2 medium red peppers in a baking sheet and bake for 35 minutes, turning twice in-between. Wrap in foil immediately and once cool enough to handle discard the skins, seeds and stems. To the base hummus, add roasted red peppers and paprika. Blend everything in the food processor until hummus is smooth and well incorporated. To make the green hummus, cook frozen green peas in boiling water for 3 minutes or according to package instructions. Add cooked green peas with freshly ground cumin powder to the base hummus. Blitz until well blended. If using store bought roasted beetroot, you can skip this step. If you’re looking for a vibrant pink beetroot hummus, we recommend roasting beetroots at home. Preheat oven to 200C. Wrap 3 medium beetroots in foil individually and bake for 40 minutes. Once cool enough to handle, unwrap the foil and slip the skins off under running water. 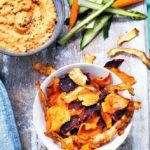 Add roasted beetroot chunks along with lemon zest to the base hummus recipe. Blitz until bright pink. Cook 2 large carrots in boiling water until tender. Add cooked carrots and turmeric powder to the base hummus and blitz until well blended. Swirl with extra virgin olive oil and sprinkle with pine nuts and parsley. 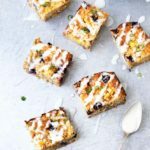 You can also try different topping combinations like cooked chickpeas, sumac, za’atar, lemon zest and even leftover roast chicken or lamb. Looking for more foodie inspiration? Check out our crispy baked avocado fries.